THIS is the moment the army bomb squad blew up a container filled with explosive chemicals that was found at a girls’ school. The experts carried out the controlled |explosion on a beach near Santa Sabina secondary school in Sutton. Teachers called the bomb squad after |discovering dinitro-phenyl-hydrazine during an audit of their laboratory. The chemical |is safe when wet, but highly explosive if dry. Soldiers isolated the chemical, which is better known as Brady’s reagent, and dealt with it after classes finished. 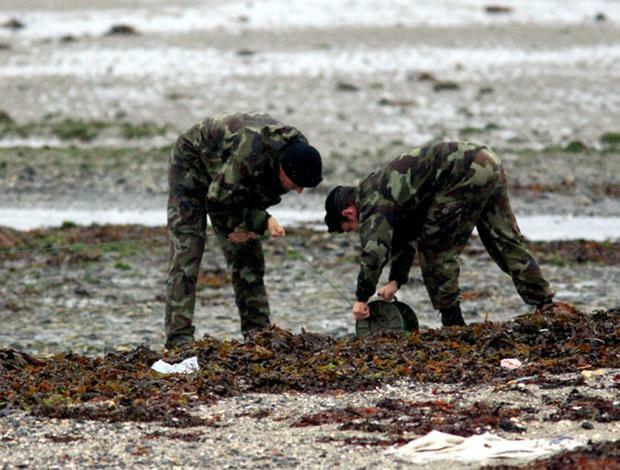 A defence forces spokesman told the |Herald: “The substance can become unstable as it decomposes and dries out, and then becomes sensitive to shock such as being dropped or banged. “We handle about two of these a month. The usual procedure is to wait until the school is empty and take the chemical compound to an open green area, where a hole is dug. “It is then placed inside with an explosive charge and the hole is covered with |sandbags before the charge is detonated. The scene was declared safe a short time later and the squad returned to their base.